Action from Eye United's 4-0 win at FC Peterborough (green). Photo: David Lowndes. Apart from a penalty shootout, Eye United are still to taste defeat, 16 matches and six months into the season. The Peterborough League Division Two leaders have only experienced one disappointing Saturday when losing a county cup tie on penalties. 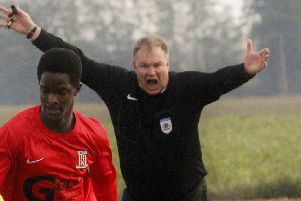 Action from Eye United's Intermediate Shield win at FC Peterborough (green). Photo: David Lowndes. Otherwise it’s been plain sailing and Eye easily won the battle of the Division Two big guns at FC Peterborough in the League’s Intermediate Shield at Fulbridge Road last weekend. Nathan Law (2), Dan Gargan and Luke Gasson scored the goals in a 4-0 win. Eye are a point clear of the fancied Parson Drove side at the top of Division Two ahead of a home match with old rivals Bretton North End tomorrow. Division Three side Feeder beat Whittlesey Reserves from Division Two 2-0 in the Intermediate Shield thanks to goals from Lewis Bradley and Jake McGuiness. Premiair, also from the Third Division, also beat higher level opponents as goals from Lee Clemenston and Ryan Alban saw off Spalding United Reserves 2-1. There was a stormy Chairman’s Shield tie between Division One rivals Crowland Town and Tydd St Mary at Snowden’s Field. Three players were sent off. Matthew Clough and Liam Rigg saw red for the hosts along with Tydd’s Dan Piccaver. Ryan Brown bagged a hat-trick for Stamford Lions A in a 6-1 League Shield success over Glinton & Northborough. Brown now has 29 goals for the A team in just 16 appearances. Lions are seven points clear at the top of Division Four. There’s a cracking President’s Shield tie tomorrow when Netherton United host Peterborough Sports Reserves at the Grange (January 13, 1.30pm). Netherton moved upto second in the Premier Division on Wednesday (January 10), but they were frustrated by a poor performance in a 1-1 home draw with Whittlesey Athletic. Netherton’s Ryan Wood was sent off for foul and abusive language in that game. The draw left Netherton five points behind leaders Moulton Harrox with a game in hand. Moulton are without a fixture this weekend. President’s Shield: Netherton United v Peterborough Sports Res, Sawtry v Holbeach United Res, Thorney v Peterborough ICA Sports. Premier Division: Ketton v Sutton Bridge United, Langtoft Utd v Deeping Rangers Res, Leverington Sports v Stamford Lions, Warboys Town v AFC Stanground Sports.